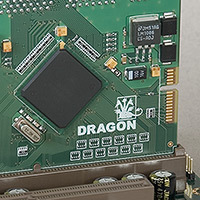 Close-up of the DRAGON ColdFire CPU card fitted in the CPU slot. The ColdFire PCF5475/266 processor on the left. 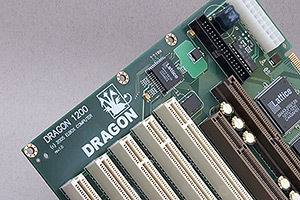 Part of the DRAGON 1200 mainboard. From left: five PCI slots, AGP slot, CPU slot, PSCs module connector, and ATX connector.